Christmas is coming soon and this festive season, Jamie’s Italian adds a touch of sparkle to celebratory menus at VivoCity and Forum. Diners can look forward to indulge in mouthwatering Italian fare with the signature Jamie Oliver twist and staying true to their ethos of sourcing sustainably and using higher welfare, free-range and traceable produce wherever possible. 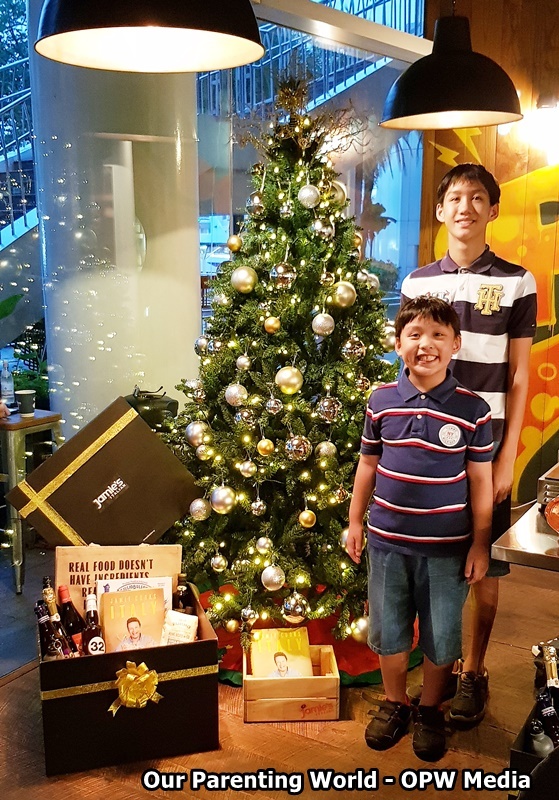 If you are thinking of where to celebrate Christmas, look no further, bring your whole family to Jamie’s Italian VivoCity. The restaurant features family-friendly space with face painting and balloon sculpting activities lined up as entertainment for the little ones and live music for the adults to have an enjoyable dining time together! Jamie’s Italian offers Lunch Semi-buffets on Christmas Day and New Year’s Day at Jamie’s Italian VivoCity, where there’s something for everyone, including pastas and pizzas that will be passed around the table just like in Italy’s family trattorias for families and friends to engage in lively conversation over a sumptuous meal. Look forward to indulge in main courses such as Norwegian salmon and Tomahawk pork chop that is made with higher-welfare and traceable pork. Other notable highlights of the Lunch Semi-buffet menus include the Porcini or Crab arancini, free-range Chicken casarecce, and Epic Chocolate Brownie. Countdown to 2019 with the New Year’s Eve Set Dinner, featuring a marvellous five-course menu with a Mimosa cocktail as the welcome drink and a fantastic waterfront view to boot. The meal offers hearty selections such as the Lamb ragu pappardelle; Tomahawk pork chop served with citrus-braised fennel, crispy crackling and luscious Christmas gravy; and Pan–seared salmon with seafood broth, fresh squid, mussels, Gaeta olives and saffron aioli. Price: *$100++ per adult and $50++ per child (12 years old and below). For every paying adult, one child gets to dine on a Jamie’s Italian kid’s meal for free. The New Year’s Eve Set Dinner is available from 6pm at *$148++ per person. *Add on free-flow house red and white wines, Prosecco, draft beer and soft drinks at an additional $45++ per person. At Jamie’s Italian Forum, diners can look forward to a sumptuous yuletide celebration with the four-course Christmas Day Set Lunch. Tuck into Gennaro’s turkey ravioli of slowbraised free-range turkey finished with rich sage butter, a dish inspired by Jamie’s mentor, Gennaro Contaldo. Meat lovers will also be satisfied with a wide selection of meats such as the Tuscan sausages, made with higher-welfare pork and fennel. Round off the hearty meal with the crowd-pleasing Christmas pavlova with whipped vanilla crème fraiche, cherries and orange zest. Price: *$80++ per person. For every paying adult, one child (12 years and below) gets to dine on a Jamie’s Italian kid’s meal for free. The New Year’s Eve Set Dinner is available from 6pm at *$148++ per person. Hampers Spread the festive cheer with Jamie’s Italian Christmas exquisite hampers, featuring a wide array of exclusively sourced festive goodies and merchandise. The Epic Jamie’s Italian Hamper ($300+) is a beverage bonanza of wines, beers and more, while The Indulgent Jamie’s Italian Hamper ($350+) showcases a luscious assortment of gourmet goods such as “Sorensina” Pecorino Romano and Grated Mullet Bottarga. The Great Jamie’s Hamper ($600+) is the ultimate gift – it is chock-full of goodies such as a black olive pâté spread, balsamic vinegar from Modena, a bottle of Prosseco, and a Jamie Cooks Italy cookbook. Orders can be sent in to enquiries@jamiesitalian.sg between 19 November 2018 and 6 January 2019.